Prime Minister Narendra Modi adressed a 'Parivartan' rally at Ramabhai Ambedkar Ground in Lucknow on Monday. This is Modi's first rally in 2017 in poll-bound Uttar Pradesh. * Should black money be removed or not? * Should we remove corruption or not? * SP, BSP joined had against me on demonetisation. * SP, BSP have teamed up against me. * People are trying to hide their money in various banks. * I am honoured, addressing such a large rally is my New Year gift. * Oppn say remove demonetisaiton, I say remove corruption. * I have been in politics for a long time now. * I have been to many rallies, but I have never addressed a bigger rally than this. * Atal ji took BJP to a new height, he served lucknow for several years. He must be happy watching this mega rally. * We want proverty should disappear. * For making India a development nation we need to change Uttar Pradesh's faith first. * Urges people to vote for development of the state baring the caste, creed and religion. * IN UP their is one party who is unable to anything for 15 years, one party obsessed with money and the other obsessed with family. How will they save UP? The Bharatiya Janata Party's mega show - Maha Parivartan rally - the culmination of six similar rallies across Uttar Pradesh, is all set to get underway here on Monday afternoon. * Parivartan Yatra will bring the real change in UP. * We will change the face of politics in UP. * I want to ask the people of UP that is there any development, has electricity reached villages are the health facilities proper? * The people of UP played a vital role in the formation of BJP government in the centre. * Modi ji is elected from Kashi he is also a UP wala. 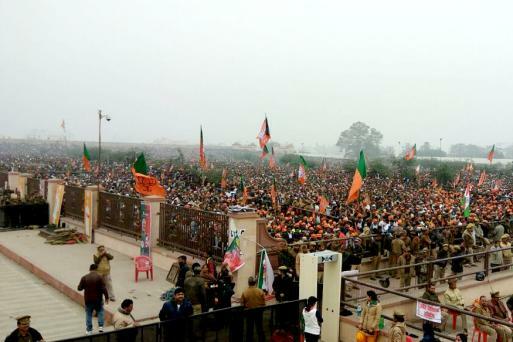 The BJP has made massive preparations to make the rally a grand success. MPs from UP and cabinet ministers are expected to reach the rally venue. Modi may announce schemes ahead of the announcement of UP Assembly election dates.